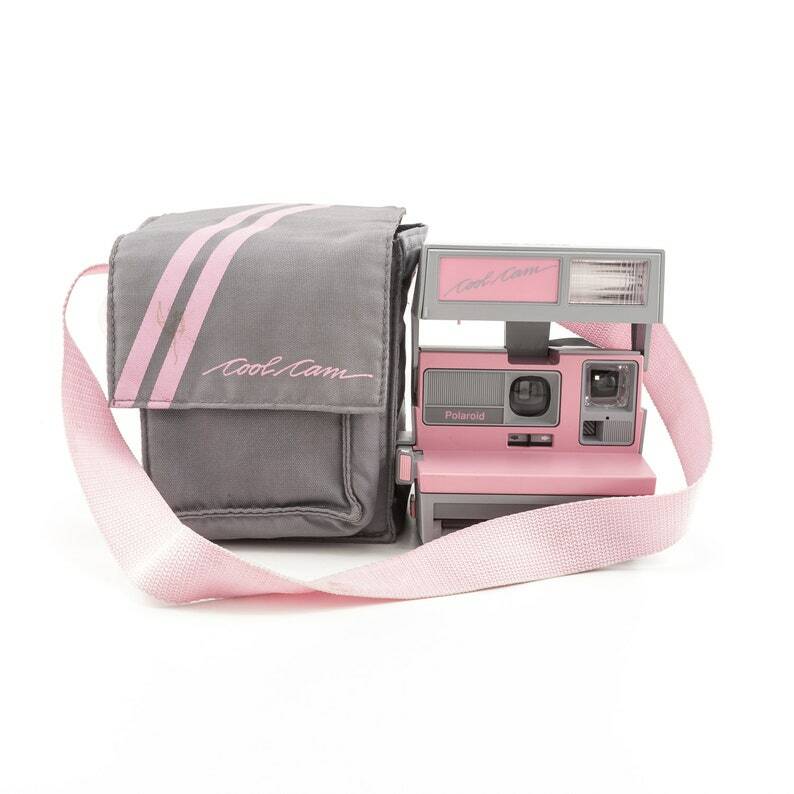 Polaroid Cool Cam - Pink and Grey with soft case. This camera is in great working condition and good cosmetic condition with a few scuffs and scratches on the plastic body. Everything works great including the flash indicator lights, both shutter buttons, and the motor runs smoothly. The neck strap is well attached but is a little faded and has a few stains. The soft case is in good condition but does have a few stains on the pink strap and it is also faded. Please see the photos for more information on condition and ask questions if you have them. In 1988, Polaroid released its Cool Cam, which was essentially the Sun 600 with flashy colors and branded with the “Cool Cam” moniker. It came in several color combinations, including Red & Black and the pictured Pink & Grey. The Cool Cam also came with a matching carrying case and a sheet of word bubble stickers that could be adhered to your photos to add some COOLNESS! The Cool Cam features a single-element 116mm plastic lens, fixed focus, with minimum focal length of 4 feet, electronic shutter, programmed auto-exposure system and a built-in electronic flash. Please note that this camera has been fully tested and cleaned inside and out. All of our cameras have been pre-owned and, therefore, may have some cosmetic imperfections, scuﬀs, or marks. Was shipped out very quickly and was received in awesome shape, thanks! I love it! The picture was perfect .